Recently, Edward Soje, a Grade Level 16 Officer in the Kogi State Teaching Service Commission committed suicide after the Governor failed to pay him his salaries despite several bail out fund collected by the state from the Federal Government. Soje, 54, who hailed from Ogori town in Ogori-Magongo Local Government had just welcomed the birth of a set of male triplets in a private hospital in Abuja, when he decided to take his life. He was being owed 11 months’ salary arrears as at the time he died. In light of this, yesterday at plenary, the Senator for Kogi-West, went on his knees and asked lawmakers to rescue the state. Senator Dino Melaye has constantly spoken up for workers in the state. He previously, said it was why Governor Yayaha Bello was sponsoring for his recall from the Senate. Not one to remain silent in the face of injustice, Senator Melaye called for support for Kogi state workers from other lawmakers. The distinguished senator who was awarded the best lawmaker in two consecutive years, explained that the Kogi State had turned the civil state workers to Internally Displaced People. 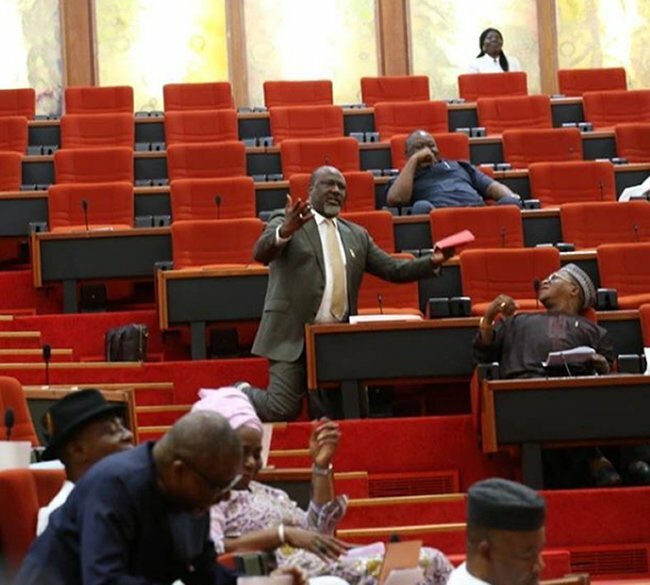 Government reacted to the death of the man who committed suicide with an official statement saying the man was not owed 11 month salary, but was owed 9 month salary, Senator Melaye explained to colleagues at the red chambers.